As a member of the Schussbaumer Ski Club, eventhough I don’t ski, I have a place to stay in Breckenridge during the summertime at their chalet, just a few blocks from downtown. As such, I headed to the mountains for some hiking. I settled on McCullough Gulch Trail, a 6.2 mile hike to an alpine lake. The trail is located off the same road as the popular 14er trail to Quandary Peak, where many cars were parked. At first, I thought I was going to have to park on the lower part of the road and walk 1.5 miles to the trailhead. Then I figured out I could pass the popular trailhead and find more parking closer to the McCullough Gulch Trailhead. I continued on to find a pullout area before reaching the trailhead at a junction of two roads. I parked here, walked to the junction and followed the rough rocky road to the right rather than the smooth dirt road that I was just driving on to the left. This was my next mistake as the less traveled, rocky road did not lead to the trail, though it did offer a few good views. Upon returning to the junction, the once empty pullout area was now filled with cars. UGH! I was going to have the trail to myself and now I was suddenly hiking with 30 people at one time. I finally headed the proper way down the road and through the gate which was very uneventful. Eventually the road reached a single track trail tangled in tree roots that climbed through the evergreen forest to a lovely waterfall. I tried walking slowly at first to avoid all the people who turned out to be an entire amateur women’s hockey team, but I kept catching up to them, so hiked a bit faster than normal to pass through the crowd. As the path neared the lake, it split into many trails that all seemed to eventually veer toward the lovely body of water. I reached the lake just in time to see two mountain goats tuck themselves into the rocks across the water from us. The two hikers who pointed them out mentioned they walked across their path on this side of the lake and then scurried to the other side…likely to hide out from the loud group of 30. 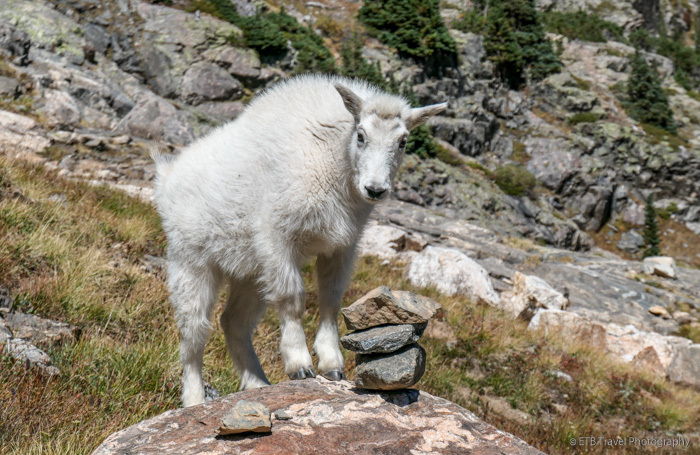 Myself included, I crossed over the creek and climbed up high on the mountainside to gain a little tranquility and to get a better view of the goats from a higher vantage point. It was a mama and a baby tucked sleeping in the cover of the rocks. As I sat there quietly admiring them, I turned a little to my left and noticed two more. They had been resting on the cliff the whole time. It’s amazing how white just blends in with grey rocks!?! I was closer to these newly sighted goats, also a mama and a baby, than I was to the originals. I quietly snapped photos of them when I noticed another pair perched on the rocks between the two other sets. I couldn’t believe it. I would have never seen them if we hadn’t spotted the first two that were moving. And they just quietly rested on the cliffs as I climbed the nearby slope unaware of their presence. In awe, we watched them trot down to the water. They crossed the creek by some fellow hikers who stood motionless. Then, as a few us headed down the trail, the goats crossed our path. I was surprised to find the mothers so docile and willing to near humans with their young. They certainly weren’t docile with each other when their young started playing and butting heads. One of the moms kept chasing the other baby off. It was such an amazing experience. Nice article, it describes all the wonders of Breckenridge. I would like to share one of my favorite spots too. The Breckenridge Ski Resort, a masterpiece created specifically for the discriminating vacationer requiring the best location. Easy access to hiking, biking and close proximity to epic discovery in the summer.